Best-in-class Engine Horsepower: Kubota's high-powered engines provide 92 HP for performance that surpasses the competition. New CRS Diesel Engine: The SVL90-2 features Kubota's renowned CRS (Common Rail System) diesel engines which deliver a powerful 92 HP. The CRS electronically controls the fuel injection timing and amount for high torque at a low rpm to improve work efficiency. Electronic Travel Torque Management: Electronic Travel Torque Management System lets you work faster with more power. The ECU constantly monitors the load of the machine to optimally control hydraulic pump output according to the load, preventing engine stalls for smoother operation even under severe conditions. Diesel Particulate Filter (DPF): The Diesel Particulate Filter meets the latest Interim Tier 4 diesel emissions regulation by collecting particulate matter (PM) from exhaust gas for cleaner exhaust emissions. 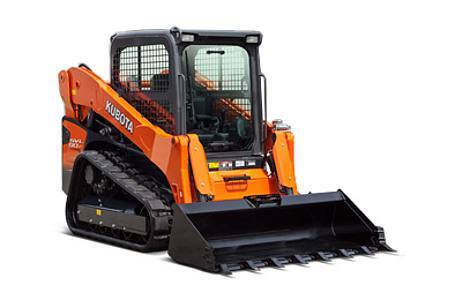 Long Reach for Maximum Lifting and Dumping, High Bucket Hinge Pin Height: Kubota's unique vertical lift is designed to deliver an exceptionally long reach of 40.7 inches. In addition, the tip of the arm is optimally shaped for a tall hinge pin height of 128.6 inches for easy dumping into trucks. Standard Self-leveling Function: This feature helps keep the bucket or pallet forks in a horizontal position without the need to manually adjust the angle during lifting. Standard Two-speed Travel: Shift from low gear at 5.0 mph to high gear at 7.3 mph to get the job done faster. Pilot Valve with Shuttle Piston: This ensures consistent oil flow which improves directional stability. High-flow Hydraulics (Optional): This option increases the hydraulic capacity for attachments requiring a higher flow. Both 1/2" and 3/4" couplers are part of this optional package. Higher Ground Clearance: A high ground clearance of 11.8 inches lets you travel over large obstacles with ease. Strong Traction Force: Kubota's original track lug design gives you more grip and a stronger traction force of 12178 lbs. Wider Cab Entrance: A wider entrance makes it easier to get in and out. Easy-clean Floor Mat and Drain Outlet: The soft rubber floor mat is easy to remove and clean. And with the built-in drain outlet, the mat can be washed in the cab. Hand and Foot Throttle: The hand and foot throttle allows you to match the engine speed to the task. The hand throttle is ideal for jobs requiring constant engine speed such as cold planing, trenching or snow blowing. The foot throttle lets the operator vary engine speed for other applications. Pressurized Cab (Optional): The cab is pressurized to keep dust, flying debris, and insects away to enhance comfort on the job. Furthermore, noise is kept down to let you work for long hours with minimal fatigue. Optimized Air Conditioning: The climate control system offers outstanding cooling and heating performance with optimized airflow for a high level of comfort all year round. Enhanced Defrosting and Demisting Functions: Ample airflow prevents the windows from fogging up or freezing during the cold months of the year. Easy-open Sliding Windows: The sliding front door and double-sliding side windows can be opened regardless of the position of the front attachment, allowing you to get in or out safely even during emergencies. Tilt-up Cab: The cab can be tilted 72° without having to lift the arm, allowing easy access to the hydraulic pumps, valves, lines and hydraulic tank. Routine Checks: Simply open the rear bonnet to access all components for daily routine inspections. Slide-and-tilt Radiator and Oil Cooler: The radiator can be tilted for easy cleaning. Large Space for Tool Box: The SVL90-2 offer a convenient and large tool box for storing a grease gun and other necessities. Welded, Integrated Mainframe and Undercarriage: The undercarriage forms an integral part of the main frame for maximum durability. Kubota Original Rubber Tracks: Kubota's original rubber tracks offer outstanding durability and long-life performance. Furthermore, Kubota's original lug pattern prevents soil from accumulating and improves traction force. Triple Flange Lower Track Rollers: A highly reliable triple flange design not only minimizes the risk of detracking, but improves stability as well.